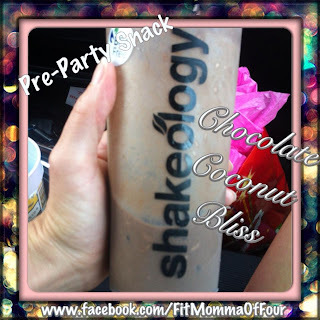 Fit Momma of Four: Chocolate Coconut Bliss Shakeology saves the day! Kids' birthday parties are filled with delectable treats that may taste good, but won't look so good on my hips. So as we drive to this party I am getting in my daily dose of dense nutrition & it's delicious!! Shake or blend & enjoy! !